The Skirmish Line – Page 8 – The Game's The Thing! 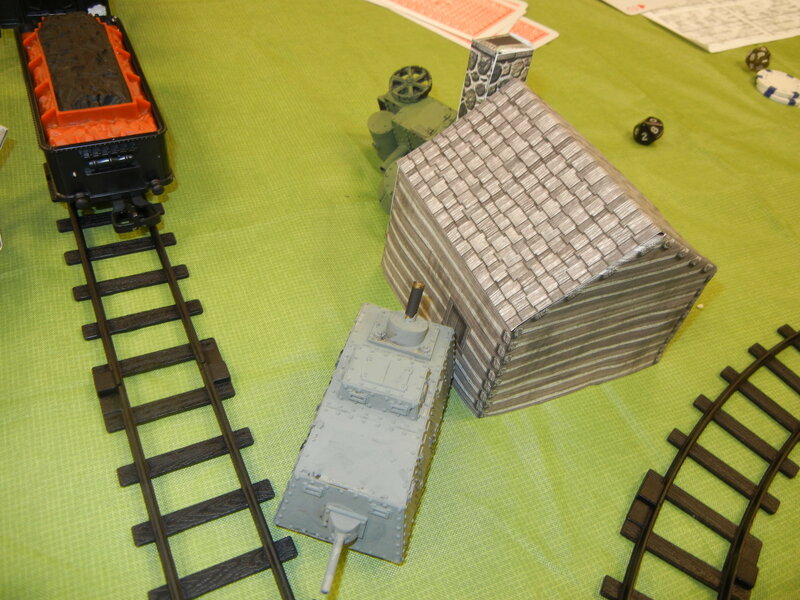 Last Saturday, I got the chance to play in a Great Rail Wars game. This game has been around for awhile. 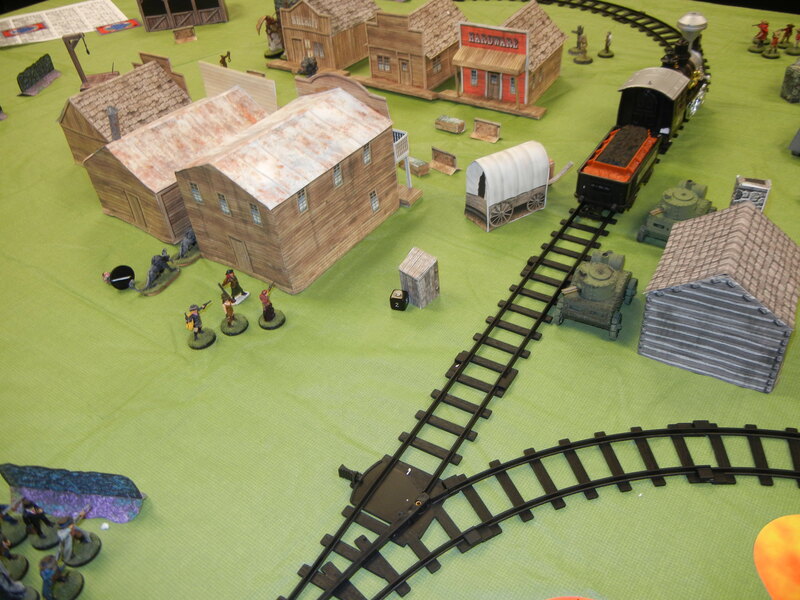 It was first published as part of the original Deadlands series by Pinnacle Games. It was so popular that its’ mechanics were used to create the wildly successful Savage Worlds RPG. It’s a fun game and I had a great time playing it. So without further ado, I bring you the saga of Science versus Sorcery! The small town of Whackerville. Little do the inhabitants know that it is about to become a battleground. The scenery was paper scenery. It looked pretty darned good. It has the advantage of being inexpensive and easy to tote around. The forces of Science, Order, and Progress (me) come to call on the locals in hopes of negotiating a right of way for the Wasatch Railroad. Actually, Wasatch Rails, under the leadership of Dr. Darius Hellstromme, is the Mad Science faction of Great Rail Wars. They have all of the Tech Toys. 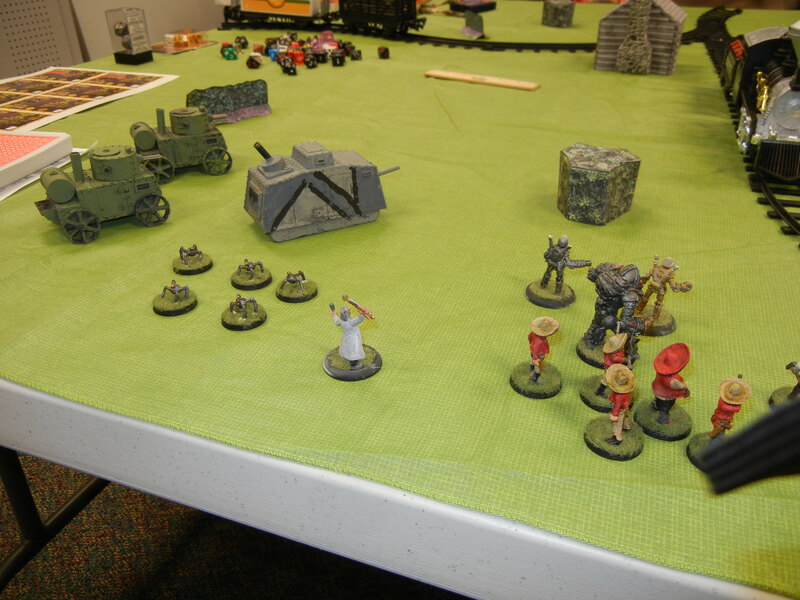 In this picture, you can see the Steam Carriages, Steam Tank, Clockwork Spiders, my command figure (Professor von Rumptrumpet), a battle suit, two walkers and a group of hired guns. Note that they are wearing Red Shirts. This will have some importance later on. The Forces of Superstition, Chaos, and other forms of Egregious Flapdoodle as led by the Witches of the Black River Railroad. The Black River Railroad is led by the wily Mina Devlin. These are the spellslingers and such. Actually, there was supposed a third faction, the Confederacy but since only Ryan and I were playing he folded both forces together. The force includes a bunch of hired guns, A Witch, her bodyguards, a wolf pack, a flock of Terror Bats, a Hanging Judge, and a Gatling Gun and crew. The Forces of Progress advance to bring the comforts of Civilization and the Fruits of Science to the unwashed masses. Von Rumptrumpet’s Panzers roll onward! The Dampfwagens (Steam Cars) moved reall fast. 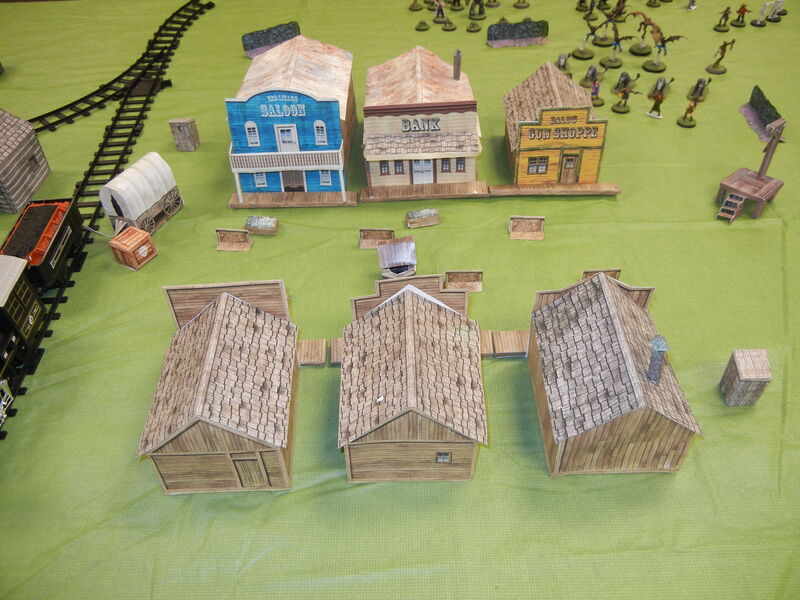 The Hired Guns, Clockwork Spiders, the Walkers and the Mechanic head into town to start peaceful negotiations with the Townsfolk. 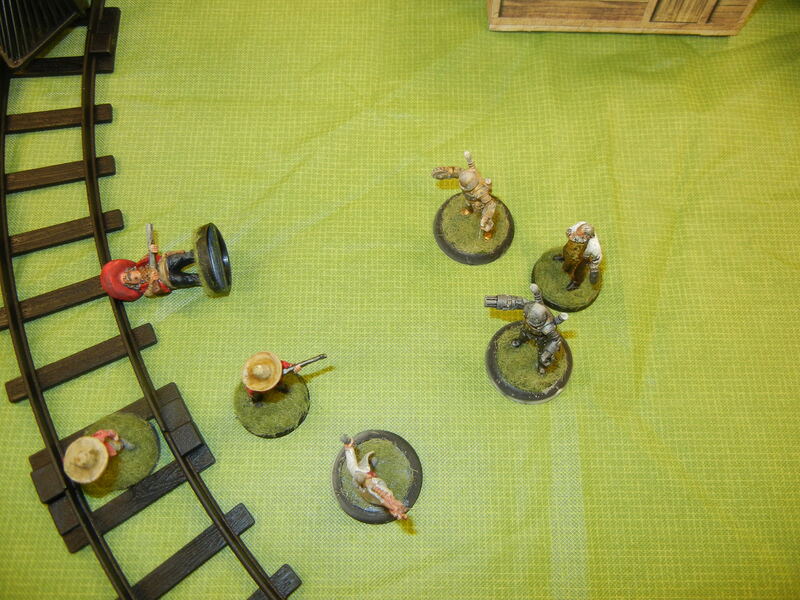 The Witches advance looking to avenge one of theirs that has fallen to the Steam Cars Gatling Gun. 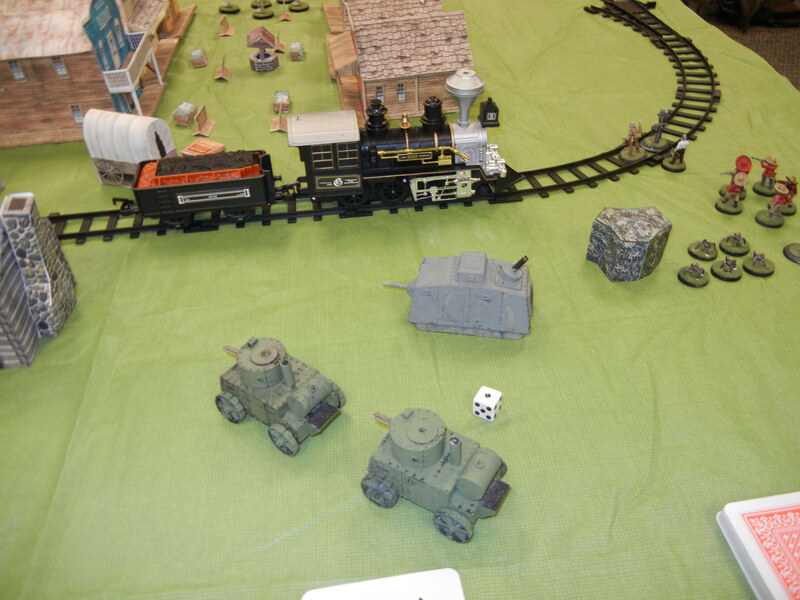 I got the intiative for the turn and was able to move one of my Steam Cars into firing position and cut loose with the Gatling Gun. I dropped one of the Witch’s bodyguards and wounded another one. The Wolves can be seen slinking into the alley way. A Creature of Darkness known as a “Hanging Judge” confronts the Technical Marvel that is a Battle Suit. This was a cool showdown. The Hanging Judge is a seriously badass supernatural critter while the Battle Suit is just as badass a Techno Marvel. 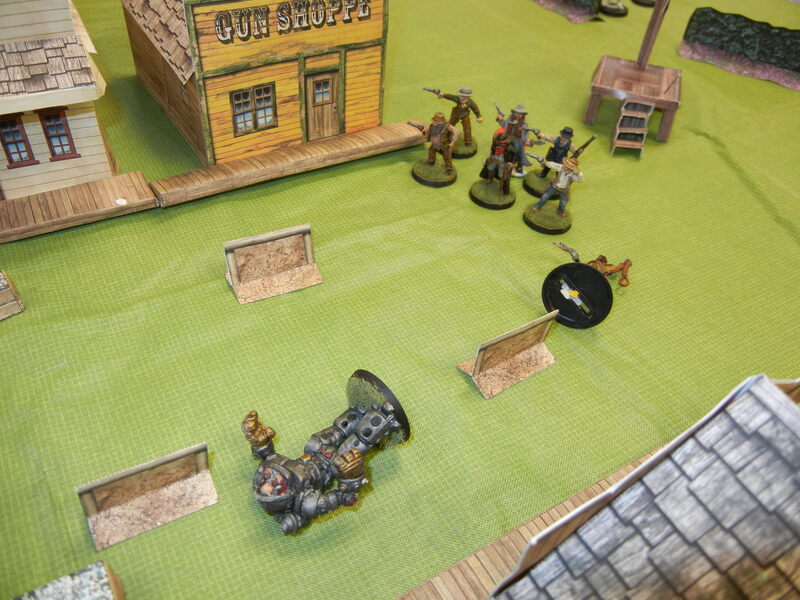 Vile Sorcery gets lucky and takes out a Steam Wagon. They shall pay for this! Although the Witches didn’t deploy Bazookas, Panzerschrecks, LAWs rockets or Plasma Guns, a good old fashioned Ball of Flaming Doom worked just as well. Fresh from their triumph, the Fiendish Witch and her Evil Sisters conjure up more trouble. It’s really cool how well this game is balanced. While the mechanical stuff is powerful so is the Magical. Even lowly Hired Guns have a chance at taking out one of the Big Boys. 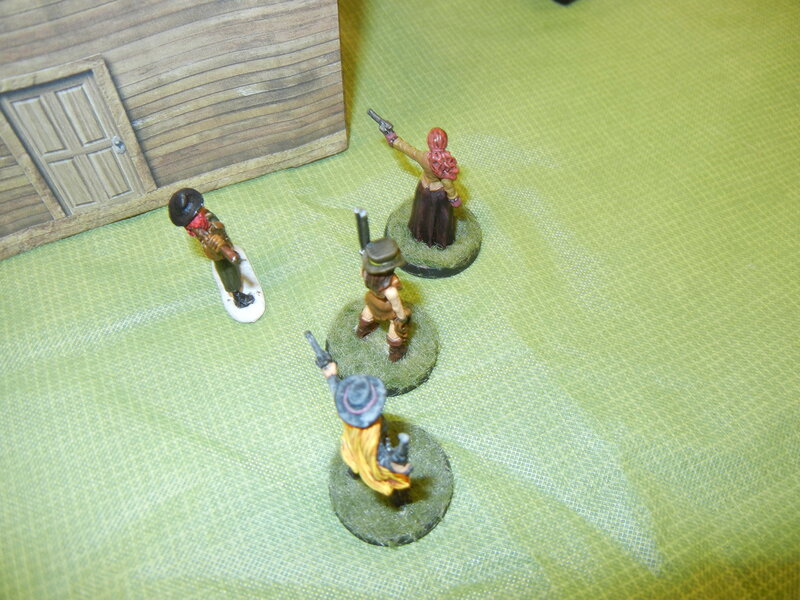 The Battle Suit takes on the Hired Guns of Black River. The Hanging Judge was dispatched earlier. It shouldn’t take long to dispose of this rabble! The Battle Suit did indeed take down the Hanging Judge…but only temporarily! You can see the Gatling Gun in the background. Alas! The Battle Suit went down in a hail of lead! But fear not, it is only a flesh wound! Actually, the Battle Suit was IIRC taken out by a Character with a rifle. Still, it was just a temporary knockdown. 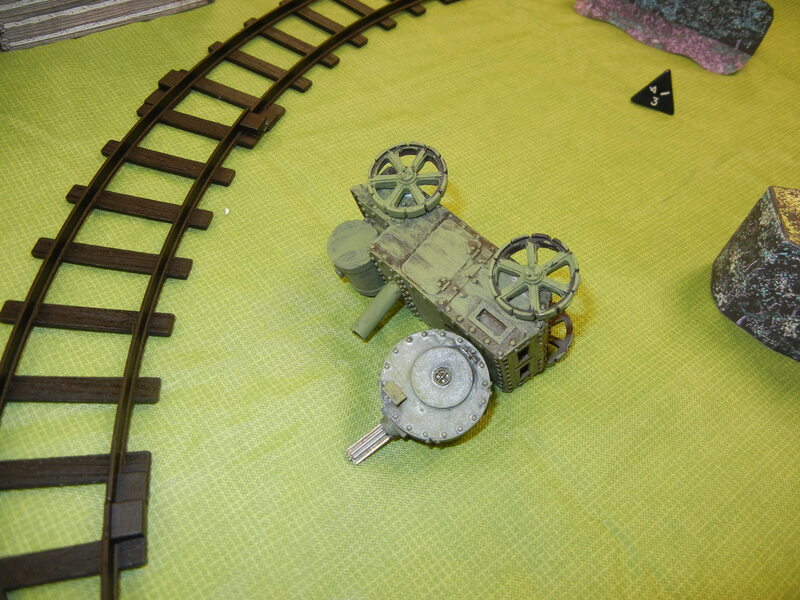 The other Steam Wagon fell victim to the Mercenary Gatling Gun. The fighting was fierce as it always is against The Forces of Darkness!!! The Gatling Gun took this one out with a really good long range shot. Again, the game is very evenly balanced and the situation can change from turn to turn. 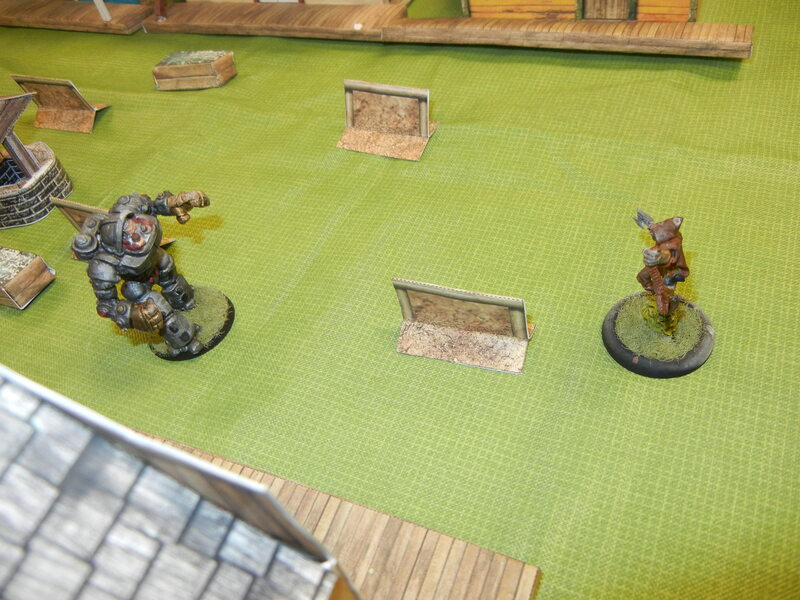 The Steam Tank moves up to take vengeance on Witches for its fallen bretheren. Justice will be swift and final no doubt. The only Unit/Character that stood a chance of taking out the Steam Tank was the Witch and her Magic. I was going to make sure that didn’t happen. 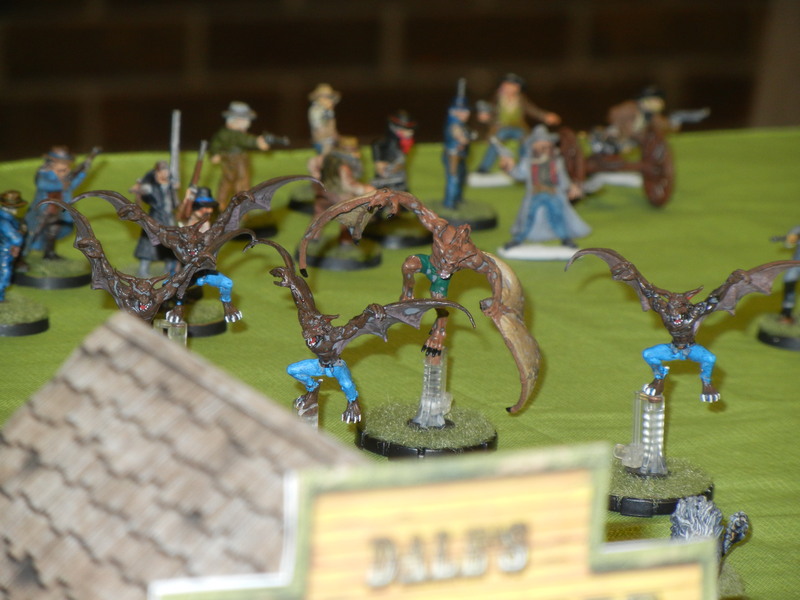 Evil Terror Bats swarm in for the attack! Will the Abominations overcome my gallant Hired Guns? Ryan Marsh told me that most of these models (the ones in the blue pants) are actually HeroClix models of a character called Man Bat. They look great. The aftermath of the assault by those abominations. We were victorious thanks in no small part to the efforts of yours truly!! 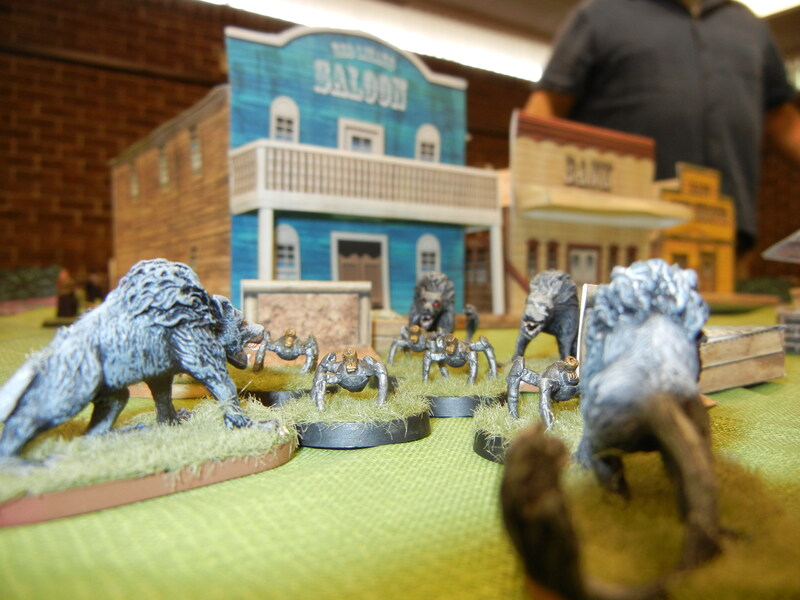 The Wolves of Black River confront the Clockwork Spiders. Raw, untamed Nature versus the Mechanical Marvels of Science. 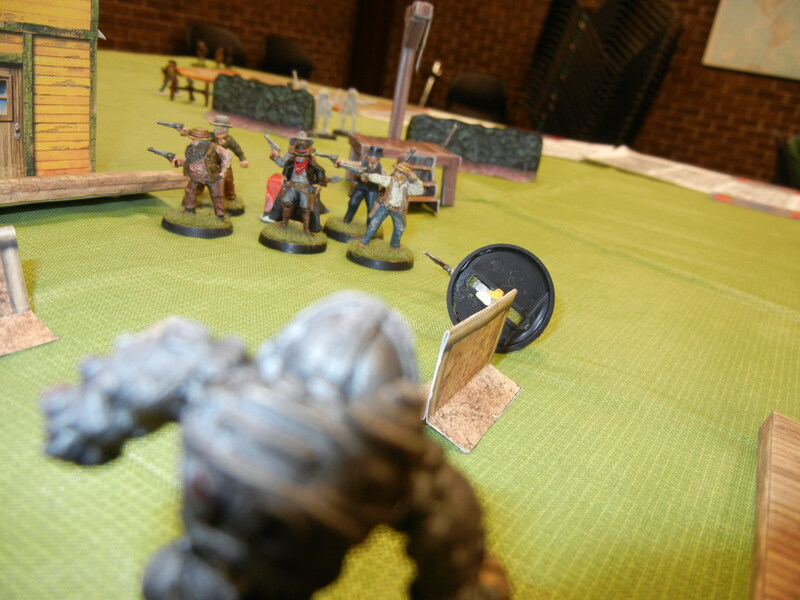 The Final Confrontation…unfortunately the game was called right about then so we could go get some lunch. Methinks the Wolves would’ve won. Overall, the battle was a draw. It was a lot of fun and many thanks again to Ryan Marsh for putting it on. 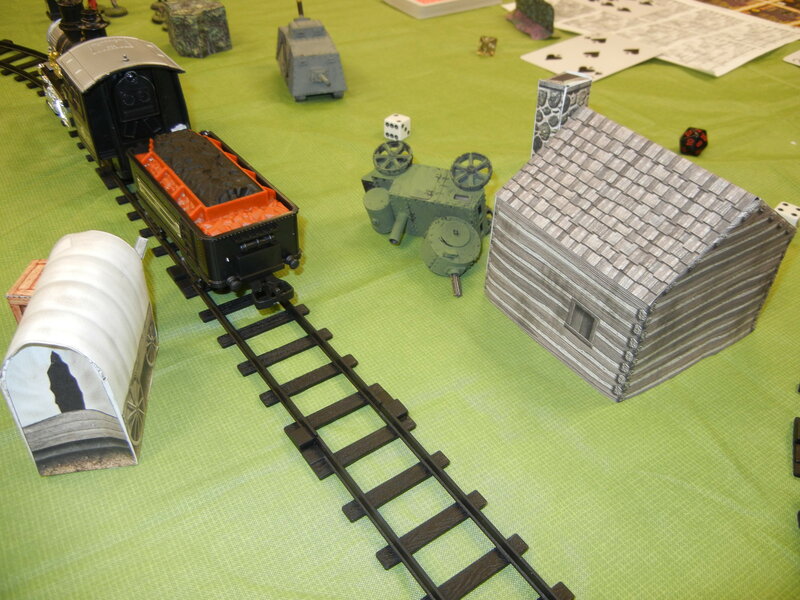 I had a great time and now I’m going to dig out my copy of Great Rail Wars and put together my own faction. Till next time…Play Games and Have Fun! What Do I Collect ? I chose this title rather than “What Period Do I Like Game In” because quite frankly I like them all. I’ll play anything. Like I said before, I enjoy the experience of gaming. So, the more relevant question should be what periods do I have collections in? I’ll narrow it down even further by limiting it to those collections that I currently game with. Steampunk/VSF: As you can tell from the pictures I posted in an earlier entry, I’m a great fan of Steampunk/Victorian Science Fiction. The German figures are mostly from Battle Honors Early WWI line (www.oldglory15s.com) while the Americans are from Old Glory’s Spanish-American War line (www.oldgloryminiatures.com). The rules that I use are the classic “The Sword and The Flame”. These rules have been around for 33 years and are indeed a classic. They can also be adapted for a variety of periods. They are my go to rules set for whatever skirmish battle I wish to fight. They can be found at http://www.sergeants3.com and are well worth the investment. 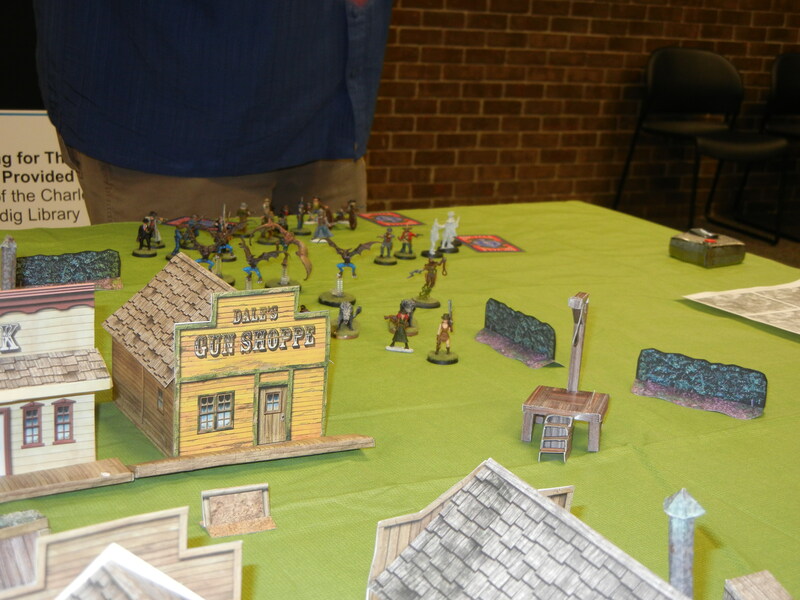 I also collect and game the American Civil War. The vast majority of my tabletop forces are from Sash and Sabre Miniatures. I cannot, however, take credit for the fine paint job. That was done for my by Reinforcements By Post. It is an excellent painting service located in Chittagong, Bangladesh. I recommend them highly. 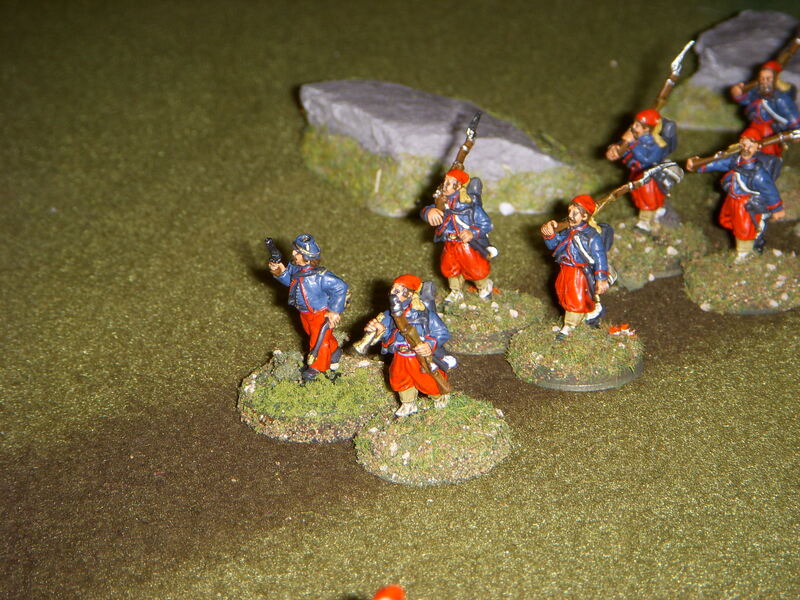 The figures shown are Union Zouaves. The Confederates are just as well done. Finally, WWII Skirmish gaming. My forces are for Northwest Europe from D-Day onward. 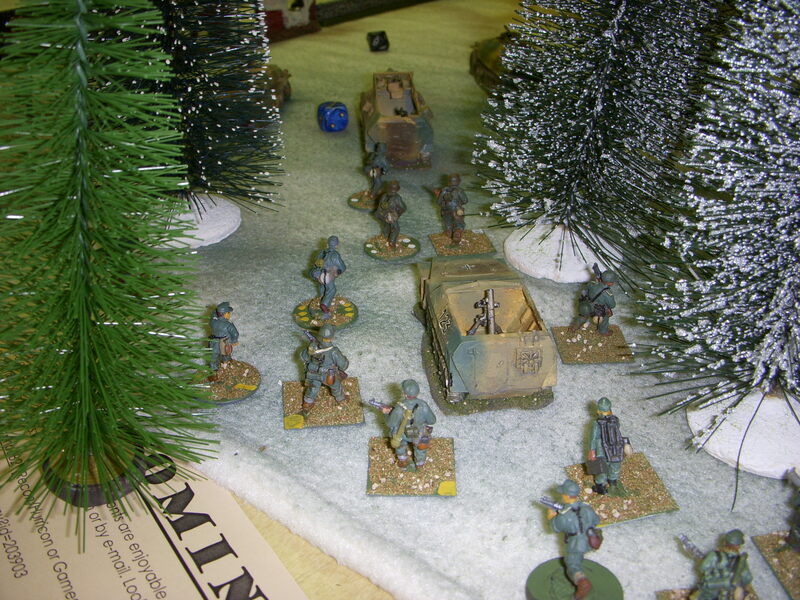 My favorite campaign in the time frame is the Battle of the Bulge. As for future projects, they include 6mm Franco-Prussian War, 28mm Mexican Revolution, and some more additions to my Steampunk/VSF collection including Canal Martian Infantry from the Space: 1889 universe. Until next time…Have Fun…Play Games! Basic Game Theory or Why Am I Doing This? This blog is dedicated to one of the great passions of my life , gaming. I like it all. I started with boardgames like Tactics II and Afrika Korps from the old Avalon Hill Company. 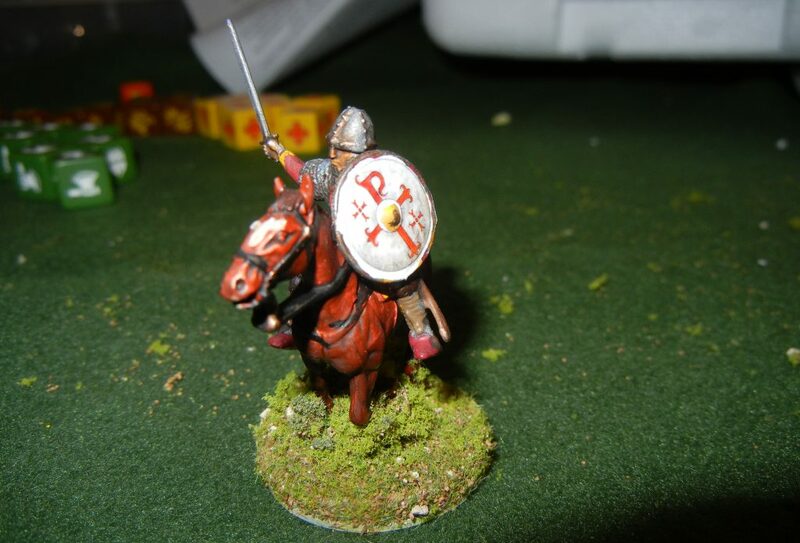 I got into Historical Minatures in the early 1970’s and into Role Playing Games later on in that decade. I’ve played a lot games since my first go round and truth be told I’ve probably lost more games than I’ve won. It’s not really the winning that is the fun part for me. It’s the socializing that I like. It’s being around friends and having a good time and believe me when I say that I’ve had some epic ones. So what makes a good game? Well, in my opinion, there are two questions that need to be answered. The first is: Are the Players having a good time playing it and secondly is the Game Master/Referee having a good time running it? If the answer is yes to both these questions then…it’s a good game. In this blog, I will attempt to explore the world of gaming as seen through my eyes. I hope you all will join with me. Let’s have a good time.